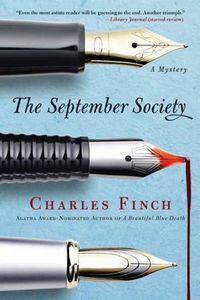 The September Society by Charles Finch, a Mysterious Review. Review: Private detective Charles Lenox is hired to search for a missing student at his alma mater, Oxford, in The September Society, the second mystery in this series by Charles Finch. The young man is George Payson, son of Lady Annabelle Payson, the widow of Captain James Payson who died during the Anglo-Sikh wars twenty years earlier. When Lenox visits Payson's rooms in Oxford, he finds an unusual assortment of items, the most extraordinary of which is a dead cat, stabbed with a letter opener, under which is found a note with cryptic writing. Other oddities include a neat line of ask under a window, a pulpy fried tomato on the rug, and a card identifying The September Society on the front, and a pink and black X on the back. Lenox begins his investigation by locating Payson's friends, but one of them has also gone missing. The police eventually recover a body from the local woods that, though badly decomposed, is identified as Payson. Lenox, unable to prevent Payson's murder, is determined to find out who killed him and why. The September Society is exceptionally well written, with solid characters and a strong sense of time and place. The plot proceeds at a moderate, methodical pace, much like Lenox himself. He views his profession pragmatically, as he tells a potential colleague interested in working for him: "[It] is, in my mind at least, both one of the least respected professions among our kind of people and one of the most important and noble in its purpose. If you are a detective and a gentleman, expect to be unheralded — misunderstood except by your friends, and even by them sometimes — looked on as somewhat odd, if harmless. It will help that you have a position and money, as it has helped me, but it won't save you from a certain, rather hard to bear kind of disrepute." His case is more of a puzzle than anything else, Payson having left what are certainly clues as to why he disappeared, and after his body is found, why he was murdered. Though Lenox makes a wrong turn here and there (he remarks at one point he was "as slow as the milk train" to catch on), he eventually manages to piece the puzzle together, discovering a link between the death of Captain Payson in India and his son twenty years later in Oxford. A bit slow in places, and probably about 50 pages too long, The September Society is nonetheless a very enjoyable mystery that has a quite engaging private detective participating in a most intriguing investigation. Acknowledgment: Minotaur Books provided a trade paperback edition of The September Society for this review.